Medical supplies company, Acumed acquired the assistance of Hampshire Mezzanine Floors in order to create more storage space as well as creating new office filing areas in Andover, Hampshire. HMF planned to move a dividing partition wall that currently separated the storage area and the office in order to create enough room to get additional shelving bays in without losing valuable desk locations. 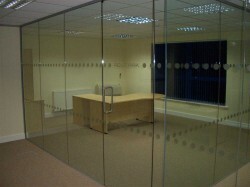 To achieve this, HMF had to move electrical floor boxes, radiators and pipework, alarm system and a partition wall. All of this work was to be completed over one weekend so as not to disrupt the client’s weekday activities. 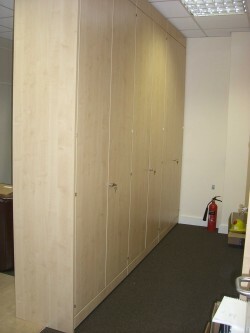 Installing new full height lockable storage units for office filing also created additional office space. The full height cupboard units were colour matched to the existing Maple furniture, which complemented the existing office environment where full height glass partitioning previously installed meant that an aesthetically pleasing storage solution was needed. The work that HMF completed in just over a week, meant that once installed, the office area benefited from the additional storage space and files that were previously left visible on desks and work areas are now safely stored away leaving the offices looking uncluttered and tidy. HMF were able to complete the job on time and on budget, without disrupting the client’s day to day business. Rigorous health and safety measures were implemented at all times to ensure a safe working environment. Furthermore, skips were brought in last thing on a Friday afternoon, filled over the weekend and removed before the start of day on Monday.